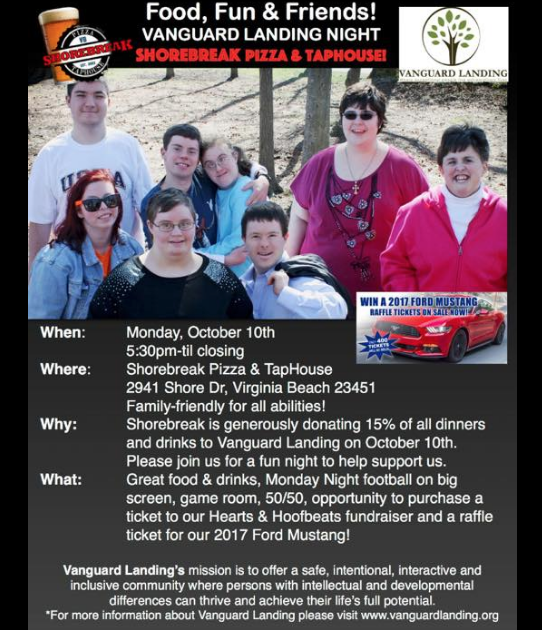 ShoreBreak Pizza & Sports Taphouse is generously donating 15% of all dinner and drink proceeds to Vanguard Landing on October 10th. Come out and enjoy your the best pizza in town and all your favorite foods (plus Monday night football!) with the whole family or a group of friends! Even better, you can buy your tickets to our Hearts and Hoofbeats Fundraiser and raffle tickets for the 2017 Ford Mustang we’ll be giving away at that event!